Why buy land for sale in Brentwood? 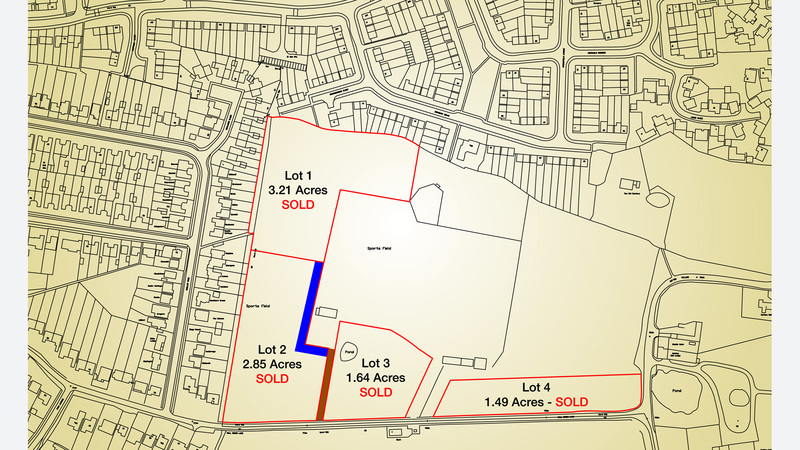 An excellent opportunity to purchase a strategic parcel of investment land totalling over 9 acres on the outskirts of the M25. Suitable for amenity use the land benefits from road frontage and is bordered by dense residential housing, which may accordingly add considerable ‘hope value’ to the site for future development. The land is situated in the expanding suburban town of Brentwood in South Essex. It is ideally located in the London commuter belt just outside the M25 and within easy reach of the A12 and M11 motorways, providing quick and easy access to London and the surrounding Essex towns and countryside. This has resulted in the town becoming a highly desirable place to live increasing local property prices and a strong demand for new and affordable housing. The area currently has a shortfall of 576 affordable homes per annum and is required to build 3,500 new dwellings by 2021. Access to Lots 1, 2 and 3 is via a track off Hall Green Lane. Access to Lot 4 is via a secure gate also off Hall Green Lane. Not looking for land for sale in Brentwood? Brentwood’s location close to London, together with other factors such as its good road and rail links, has resulted in the town and the surrounding villages being highly desirable places in which to live. Demand for new housing has, and will continue to be high. The number of households has continued to increase as household size has reduced and, therefore, the demand for further housing in the Borough will continue. Property prices are generally high, indeed Brentwood is ranked the 5th highest authority in the East of England in terms of the severity of affordable housing pressures in a report commissioned by the Housing Corporation. This has led to Brentwood showing an above average level of need for new affordable housing compared to national and regional averages. The backlog of existing need for affordable housing suggests a requirement for 48 units per year and the newly arising need a requirement for 672 units per annum. These two figures together total 720 units per annum. The total estimated supply to meet this need is 144 units per year. This therefore leaves a shortfall of 576 units per year. In 2008 the East of England Plan stated that Brentwood’s housing allocation for the period 2001 to 2021 is to be increased from 2,900 dwellings to 3,500. Nearby Shenfield train station will act as the East railway terminus for the £16bn Crossrail project which cuts through the heart of London, connecting Essex to Berkshire. Crossrail is a project to build major new railway connections under central London and will be integrated with the London Underground and National Rail networks. Up to 24 trains per hour will run from Maidenhead and Heathrow in the west to Shenfield and Abbey Wood in the east; linking Heathrow Airport, the West End, the City of London and Canary Wharf. Crossrail will deliver substantial economic benefits to the areas involved and across the country. The estimated benefit of Crossrail to the UK economy is at least £36 billion. It will encourage regeneration and provide access to thousands of job opportunities. Brentwood is a suburban town situated in south Essex providing an excellent commuter town to London and the surrounding areas. It has an expanding shopping area and high street and beyond this there is an extensive sprawling residential development entirely surrounded by open countryside and woodland. The well-established local infrastructure provides easy travel into London and the nearby towns of Romford, Basildon and Chelmsford. This is facilitated by easy access to the A12, the M25 and rail services. The A12 is a major trunk road running from London to Great Yarmouth. It links the site with the M25 and passes through Chelmsford. Chelmsford is the county town of Essex. It has a dense population that is still growing. It is a modern, well placed town that has a large number of commuters who work in London. The town has seen rapid redevelopment in recent years as its population expanded. A major new development was completed in 2007 in the West End of the town that contains a new bus station, shops and luxury apartments. Another site is in its planning stages to create a new neighbourhood that will be an urban village containing 3,500 homes. Redevelopment continues in the town as plans were revealed for another large development of shops, bars and restaurants. Another development recently finished contains luxury apartments and two restaurants. There are other new developments ongoing throughout the town during 2009. Nearby Basildon was designated as a new town to accommodate the London population overspill. The town centre boasts many high street stores as well as a Shopping Centre that is home to over 100 retailers. Further outlets can be found at Westgate Shopping Park. Romford is less than 7 miles from the site; a large suburban town in northeast London with a considerable catchment area. It is one of the major metropolitan centres identified in the London Plan; a spatial development strategy to make London a more prosperous city with strong and diverse economic growth and accommodate London’s growth. Romford now forms one of largest commercial, retail and leisure districts outside central London and has a well developed economy. The City of London can be reached by rail within 23 minutes from the local Shenfield Train Station. The London Underground Station of Upminster, on the District Line can also be found close by. To arrange a site visit or to buy the land for sale in Brentwood; please call 01727 701330 or email enquiries@vantageland.co.uk.